Each hospital is going to have different security policies pertaining to everything from emergency care to visiting hours to loud talking, arguing and fighting, but when it comes to labor and delivery, the most important security policies are those that protect mom and baby. You can be certain that all hospitals will have a different set of rules and methods in place to ensure optimal security, but here are a few policies common across the board. Moms and infants are giving matching identification bracelets. Hospital staff will verify the IDs match every time baby is brought to you. 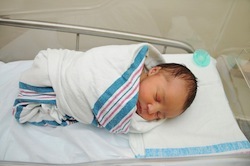 Some hospitals place electronic location devices on baby to increase security. Never give baby to a staff member unless they verify who they are with hospital ID. Never leave baby to use the bathroom or take a shower - call a nurse for assistance. Check your ID bracelet against baby's when taking baby from hospital staff. You can never be too safe, but don't spend your entire hospital stay worrying about security. The hospital has done this a time or two.